Memphis, Tennessee! It's the jewel of the Mississippi, a musical crossroads where the rural sounds reach an urban audience. Here the Blues found a forum, Rockabilly a stage. And tonight, we celebrate this musical city with a triple-feature of music, exploring the lineage of Delta music from one of he last great Jug bands and two of the first great Blues musicians! And a drink, of course. She's talking about a dance, of course. Who could possibly stay away? After such a musical tour de force, we need cocktail as deceptively simple, yet ultimately layered and complex, as the Memphis sound itself. 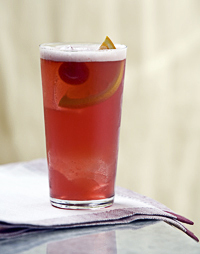 How about a Sloe Gin Fizz? Not too many sloe berries on this side of the pond, but some wild plums enfused into homemade gin will do nicely. Fill a highball glass with cracked ice. Add Sloe Gin. Squeeze and drop half-lime in grass. Fill to brim with seltzer. Grazie, Miss Lenore...and if you know of a good Italian city and musician of the era worthy of a Cabaret visit let me know! It's so far from my cultural inheritance, a very different place from the Italian cities in those same years ... But what a lovely thing to celebrate Memphis! Not surprising. There was a lot of musical communications between these two cities. One article I read researching this cited Bessie Smith and Louis Armstrong as the foundations of popular Jazz in America. I think that understates the contributions of others, but it does well to remind us how much we owe to these two. Speaking of the Big Easy and Louis, the Cabaret visited the latter in the former earlier in its run...and may do so again soon! PS: for those interested in the Jug Band sound, the Carolina Chocolate Drops have resurected the old "Black String Band" sound for a modern audience. Actually brings memories of the "Big Easy"!